A lot of Aboriginal people talk about the healing (emotional and otherwise) of being 'on country' and a couple of weeks ago, I went to Central Australia for exactly that purpose. Being out on my Arrernte homelands, I am able to get out of the daily hustle and bustle I experience living in one of Australia's big cities. Out there, I am part of something bigger — a feeling of belonging that is difficult to explain to those who don't have such ties to land. When I'm in the desert, I'm in a place where my ancestors walked and thrived for centuries under some of the toughest conditions in the world. Where they carved and painted our stories into stone, and navigated these vast landscapes via song or stars. Where they found enough food and water to stay nourished and strong. Where they swam in and camped by pristine waterholes. In the middle of nowhere, the red dirt of the ground reflects the red tinge in my otherwise dark hair. Knowing where you've come from is a powerful feeling. Beyond that though, it's a special experience to drive through the cattle station on which your grandfather was born, or through the one your great grandmother was born on. Ancient places which acquired new names as settlers brought cattle in and used traditional custodians as free labour. These are names and words which many Arrernte people are fighting to retain and pass down to their children so they're not lost. Despite colonisation, Arrernte remains one of the more complete Aboriginal languages, yet as successive governments try to stop bilingual educational programs in NT schools, or as misspellings of words persist all around Alice Springs (Mparntwe), it remains under threat. Without the hard work of committed people, who knows what will remain in a generation or two? Being on country is not all healing. On these ancient landscapes the impacts of colonisation become clear to see. Invasive buffel grass dominates the landscape, taking over from native spinifex every time a fire goes through. Animal species that are reliant on these native grasses become threatened. Wild horses, camels and marked cattle stomp through the ancient dry waterways damaging the beds and the plant life which marks the edges. There's a saying in Mparntwe which goes 'If you've seen the Todd River (Lhere Mparntwe) flow three times, you're a local.' Despite my not living there, I have seen it flow three times and indeed, stood in those rare running waters as a child. It's a majestic sight as water runs around the ancient river red gums. Yet the running water is marred somewhat by the loose sediments and debris — the river tainted after generations of environmental degradation. Local government is working to protect the Todd, but it will take a long time to fix what has been degraded by generations of neglect. It's these reflections, among others, that I will be drawing on as I march in this year's Invasion Day protest. So many people claim to be 'proud Australians' yet they have never gone to see rich landscapes such as this and then bear witness to the damage that has been done to them. They don't value the ancient ceremony and birthing trees in Western Victoria, nor the Awabakal butterfly caves in NSW. They're not concerned that Torres Strait Islander communities are currently being impacted by rising sea levels due to global warming. "Australians all stand to benefit from living in a country where the lands are cared for and fruitful, where true history is taught and learnt from, and where the diversity of more than 200 groups of sovereign owners is celebrated." We're additionally told that jobs and making money via fracking operations is more important than protecting the Great Artesian Basin — a waterway millions of years old which has nourished people for thousands of generations. These same arguments are used to justify the current threats to traditional lands and the Great Barrier Reef caused by the Adani Mine proposal. Racist people have commented to me that if we were 'real Aborigines', we'd all go back to living off the land. Yet for so many of us, this option is impossible. The waterways are dry and polluted, the food sources are scarce and the damage is near irreparable. There is no day where this struggle to educate others living here does not continue. Until we reach a point of truth-telling and reparations in this country, an alternate date simply won't exist. To quote academic and veteran activist Gary Foley, 'Native Title is not Land Rights.' Our ability as traditional owners to veto projects which will negatively impact our lands is non-existent in most cases. In addition to this, we're still being forced off our lands by governments; for mining projects, via exorbitant child removal rates, and via the worst incarceration rates in the world. People are still dying in custody. Community members are still trying to reconstruct languages and therefore knowledges which have been long taken from us. Every step of the way, we are still fighting to protect and maintain our families, our communities, our lands, our languages and our rights as peoples. 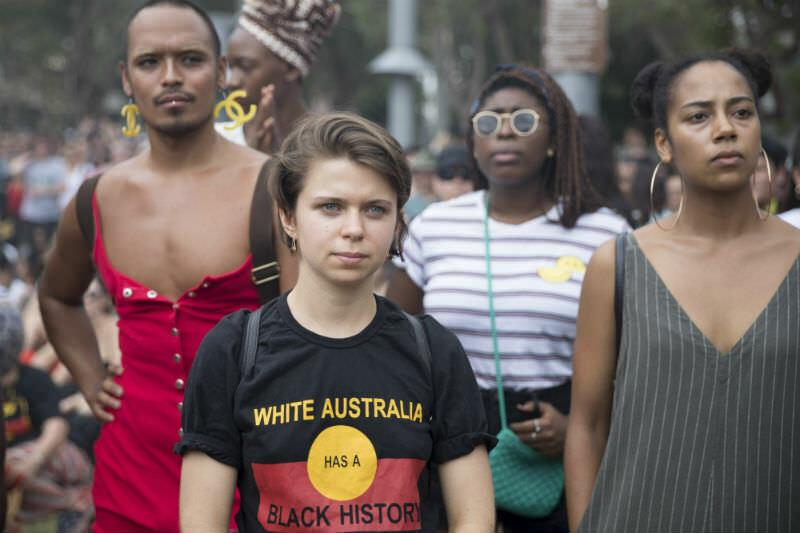 Political parties who now view taking a stance on the growing protests on 26 January as a way of increasing their votes at the upcoming federal election like to pretend that the reason we march on this date as Aboriginal and Torres Strait Islander people is that we wish to 'change the date' of Australia Day. Yet when you look around the lands and you look at the fights Aboriginal and Torres Strait Islander people are engaged in to protect that which was cared for by our ancestors for so long, you realise that every day is a fight against colonisation, the legacy left by invasion and the ongoing impacts upon our peoples. So this Invasion Day, instead of calling on Aboriginal and Torres Strait Islander communities to conform to simplistic solutions such as changing the date of a public holiday geared around reinforcing jingoism and nationalism, walk alongside us and commit to doing better. Australians all stand to benefit from living in a country where the lands are cared for and fruitful, where true history is taught and learnt from, and where the diversity of more than 200 groups of sovereign owners is respected and indeed celebrated. March for that future. Excellent Celeste. You have said it all. I am sure that many non-Aboriginal people born in this country, despite the immutable fact that they are here because England brought Europe to these shores, have a similarly emotive attachment to land and country. We should all celebrate that. Thank you Celeste - this is a significant contribution and absolutely reframes this annual debate to a new place. I can only hope our leaders are thinking deeply about the way in which we celebrate Australia Day (regardless of the date). This article has lifted my spirits - I am still reeling from the notion that a circumnavigation of Australia in an Endeavour replica will in any way promote that other jingoistic word - reconciliation. Thank you. Thanks Celeste: "where true history is taught and learned from" captures our national dilemma exactly. Of course 26 January was invasion day. These were no high minded free settlers of vacant land. Sydney Cove was a straight out prison settlement, on illegally seized land. And a true history would show that the first fleet convicts (I'm a direct descendant of one) were victims of a legal system without justice, penalties of extraordinary severity, and a gratuitously wicked and brutal prison regime. I have no pride therefore in 26 January but I do have pride in sharing our ancient land with its thousand-generation owners and guardians. But as you point out, the descendants of the oligarchs who created the 1788 prison camp are still at large trying to despoil our extraordinary country to enlarge their wealth. Thanks Celeste. 26 January 1788 was indeed Invasion Day! It marked the dispossession of our indigenous people from their land, a land they had nurtured for over 60 000 years. And look at what has happened to both our indigenous people and our natural environment since then! Very well said Celeste. Everyone in our nation needs to hear the shameful truth; just as Afrikaners needed to listen to their 'Truth and Reconciliation Commission' and just as Germans needed to read the proceedings of the 'Nuremberg Trials'. (We might also remember The Invasion occurred 18/20 January 1788, not 26th.) Everyone who joins an 'Invasion Day Protest' is taking a stand for truth and that is surely a precondition for us to receive God's blessings on our society? The most significant part of our recent national historical truth is that wonderful, ancient societies, unique in this world (and possibly in the whole universe) were wantonly despised and almost destroyed. Genocidal and culture-destroying actions deprived the world of access to outstanding and long-enduring sociologies based on R.E.L.E.S. (that is on Respectfulness, Egalitarianism, Lawfulness, Ecological-Wisdom, and Sharing). Even more tragic: this was often done mindlessly in the name of the Christ, who lived, loved, taught, and inspired others to live by R.E.L.E.S. Truth-twisting has been and still is the-name-of-the-game in Australia. Twisting language is one of the main tools employed to obscure what has really been going on. This is further explored in 'The Anthropocene Misnomer', available free on the web. Thank you Celeste for this truthful article.. One that needs to be read from 6th class up, at all schools. We need to know our history in order prevent atrocities again happening. Perhaps in knowing, we could offer more recognition ,compassion and sorrow for the treatment towards our first Australians This knowledge may help us to recognise that "dignity "is due all!!! Thanks Celeste for framing this debate broadly, as it should be. We’ll be there. Refusal by the outgoing government to engage in the basic humanitarian necessity of truth-telling about our nation's history; their refusal to respectfully and equitably relate to the Aboriginal owners of this continent and their living descendants; and their trivialisation of Aboriginal claims for access to a just and rightful position of honour in our legislative assemblies, may boomerang on the whole nation. The 'devil-may-care' message is clear: "It's OK to invade someone else's lands; brutally subject them to serfdom; rob them of all they have; exclude any survivors; and, lie about it all." Apart from its inherent iniquity, how diplomatically-dangerous is this! They've set the scenario for populous nations in our region to take a-leaf-out-of-their-book and, under ambitious leaders, to think that what our government illegally legitimised might work well for them, too. If Australia is to be the regional example we all truly want it to be, we need to get our house in order; and, smart quick. It's past time for our political leaders to prioritise The Uluru Statement and begin the long-awaited process of genuinely Healing the Heart of Australia. January 26th is wrong as a national day because it is invasion day where our own High Court stated was official theft day in Mabo decision to overturn Terra Nullius. It saw destruction of two aboriginal sacred sites on the first day. It recalls the delivery of dead convicts because the slave owning ships which had been leased were paid per body[ alive or dead]. It is foudnig of colony in New South Wales not the whole country. An alternate date would be near the present Queen's Birthday Weekend in June when Flinders completes the circumnavigation of whole country with extensive aboriginal and Torres Islander help as well as aboriginal guide on board. He compliments the work of French explorers which brings in multicultural aspect. Both men benefitted from earlier work by other nations as well as aboriginal intelligence for food ad water. Flinders then fought for the name " Australïa" for the rest of life rather than the other names the British government had in mind. He was supported by Lachlan Macquarie in this project. The name evolved from Terra Australis of the Holy Spirit which incorporates the Christian and Dreamtime religious beliefs. Rob Mundle,among others, has described his work in superb detail. Jan 26th can go to a NSW holiday for white settlement and for the rest of us remain as an end of summer holidays and formal beginning of our working year just as the First Nations peoples celebrate several seasons to reflect the subtle changes in nature beyond the European model. The June holiday is an nonsense when the Queen's birthday is in April and Charles is in November. So we can turn it into a genuine national celebration of how we have worked together to make it a welcome country from or oldest residents to our most recent. Hi Wayne McGough: Great lateral thinking. A truth-based, intelligent, inclusive, and reconciling suggestion. I'd vote for you! This piece doesn't speak for all aboriginal people by any means. Seriously: how many aborigines are yearning to return holus bolus to their traditional lifestyle, free of supermarkets, air conditioning, computers, iphones, antibiotics, the internet, cars, flush toilets, the rule of (Western) law, the science which identified the Great Artesian Basin, etc, should waterways and their attendant traditional food sources become available? The fact is that the vast bulk of those of aboriginal lineage are part of mainstream, post “Invasion Day” Australia, and flourishing there. I have absolutely no objection to those who choose to return to traditional lifestyles, nor to other non-aborigines who wish to follow in their steps. It’s a free country! I wish them well. But let me go out on a limb with a host of aborigines and suggest this is not the great desideratum of all or even many Australian aborigines, at least as I know them today. Why is it “racist” to point this out? Congratulations Celeste Liddle for your article written for Invasion Day 2019. You have touched on so many important aspects of Australia's history that need serious consideration by all Australians. It appears to me that the support for a national day that is not linked to dates associated with the British invasion and occupation has increased greatly on recent times. This would appear to be so in the more conservative media where alternative voices that were ignored a few years ago are now are now receiving more sympathy from correspondents than before. Given the huge problems that humanity faces from the massive pollution we have created that has contributed to climate change and massive environmental health problems internationally, it was excellent that you raised the connection between true land ownership and having control about what happens on that land. In her iconic tome about climate change "This Changes Everything - Capitalism Vs the Environment", the famous Canadian author and social activist discusses the importance of taking urgent action to avert environmental disasters. Amongst the many factors she sees as being importing to avert disaster, she believes that indigenous communities around the world are crucial in the struggle. On Australia's Invasion Day 2019, Australians of goodwill need to give our solidarity to our First Nation people to have a greater say in the nation's decision making and improvement in their rights as well as protecting the environment. There is not a binary choice here that asks Indigenous people to choose between assimilation into modern Australia with all that this implies for their heritage, or a complete reversion to pre-invasion hunter/gatherer living conditions, presumably with no support from the rest of the country and restricted to areas where the rest of Australia has no interest. Putting up silly extremes is an unreasonable and unrealistic denial of the complexity of relationships Indigenous people have with their land and with other Australians. Turning back the clock is not the answer. Australia today is what it is, for better or worse. But it can be so much better. The Uluru Statement from the Heart is a statement of grace that was misrepresented for political purposes. I hope whichever party wins the election will look again at the Statement and actually work with Indigenous people to create something better. True, HH. There is no prospect for going back to "pre-invasion/settlement" days and like you, I know many Aboriginal Australians who have no desire to do so. However, there is great need to restore dignity to the Aboriginal people through recognition of the primacy of their place in this country, through restoration of the lost culture, preservation of language and laudation of the place they have played in post-invasion Australia. The indigenous soldiers who fought and died under this country's banner, for instance, were just as brave and some no doubt braver than some of non-aboriginal descent and did not deserve to be excluded as happened after both world wars. This is but one example. Thank goodness we have finally recognised this and now see increased education, entry into the mainstream professions and genuine attempts to resurrect the ruined culture. I believe most non-indigenous Australians support and welcome that. The next step is for some in both the Aboriginal and non-Aboriginal communities to do the same and for governments to get on with it without point scoring like schoolboys playing marbles.. Very well said Brett, Andy Alcock, Dr John, and all. Someone needs to forward these well-informed, insightful, and necessary comments to the next government in Canberra. Many thanks again to Celeste Liddle and Eureka Street for this important article. Let's hope that "Healing the Heart of Australia" will be well-and-truly prioritized this year. JF, I agree with you. But let me state firstly: Australia wasn't invaded. It was settled. There were some appalling massacres by whites of aboriginals (Myall Creek, etc), and there were hopeless attempts to deal with the great divide in cultures (basically, the whole Tasmanian history of aboriginal-white interactions), sometimes benevolent, sometimes malicious, but to insist on "invasion" as an overall description of the way the British settled this continent is a wild distortion of the facts. Sure, it's very fashionable among the left - just as is the application of the term "genocide" to more recent attempts to remove mixed-race children from almost certain death - but it's equally an invention. I agree entirely that aboriginal contributions to Australian society should be recognized and in many areas have not been - such as the superb part played by Aboriginal soldiers in wartime. (This is where the Left is hoist on its own petard ... faced as it is with recognizing aboriginal contributions to Western late imperial capitalist expeditions. The horror!) Aborigines have contributed mightily to the building of the Australian nation, and what the heck, even if many of them haven’t, so bloody what? I myself am struggling to come up with anything I've contributed. But I'm still a proud Australian! We are Australian, not as a a result of some utilitarian reckoning. It's simply because we recognize that the British settlement, with its rule of law, property rights, etc etc ("What have the Romans done for us?") is a huge advance towards a more humane way of ordering our commonweal. Aboriginal women benefited from the earliest days, freed in many areas from sexual slavery and domestic violence. If the left were seriously advocating for women, they would welcome the suppression via British settlement of sexist violence such as that inflicted on Barangaroo by her husband Bennelong. Of course, the left is not concerned with such trifling matters.